Chicken and dumplings has always been a hit for hundreds of years. This feast eliminates left-overs because it is so delicious. Now this recipe is usually made at home with a full kitchen but a couple of years ago we were parked with our RV in a campground in the British Columbia. We met another couple and their two children who were camping with their RV nearby. Early in the afternoon we were invited to dine with them at dinner that evening. Expecting the usual burgers scran-up we were amazed to see a meal fit for a king laid out on the camp table. All of it cooked on a three burner stove outside and the RV oven inside. Wow. We cleaned up. With the chickens in a large pot sprinkle the salt, cover it with water and allow to come to a boil. Reduce the heat and simmer until the meat is tender. Take the chicken out of the pot and set it aside while you remove the backbones. Now add in the chopped up carrot, celery and onion and simmer for half an hour. Remove from the heat, add the chicken stock base, strain and keep ready. Melt the butter and mix in 1 cup of flour and stir until smooth. Add this to the chicken stock. Simmer for 5 to 8 minutes. Add the lemon juice and sherry, salt and pepper to taste. Combine 1 ½ cups of flour, baking powder and ¼ teaspoon of salt in a medium mixing bowl and cut in the shortening until the mixture imitates meal. Blend in the milk but not too runny. In a saucepan pour in a ½ inch of water. Place a rack in the saucepan that will come 2 to 3 inches above the water. Now place a piece of waxed paper slightly oiled on the rack with the oiled side up. 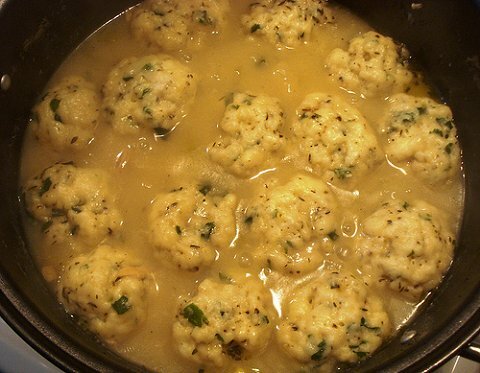 Get the water to simmer and drop the dumplings onto the wax paper a tablespoon at a time. Keep them separated as they will expand. Steam them for eight minutes and then cover them for another eight minutes. Now skin the chicken and remove the bone if you wish. Cut into good sized pieces and place them in a casserole and arrange the dumplings over and around the chicken. Finally cover the goodies with sauce and enjoy your chicken and dumplings. In the past while I have tried baked chicken recipes, chicken salad recipes, chicken enchilada recipes, bbq chicken recipes and a chicken pot pie recipe but for the life of me I cannot even come close to the taste I get when I dig into the Kentucky fried chicken menu. Popeyes chicken is good but it still cannot come near the taste. Don't you simply love chicken and dumplings. A Chinese chicken salad recipe is one thing, but for a nicer meal try a chicken gumbo recipe or a chicken parmigiana recipe. Even though white bean chicken chili is not my favorite I really like chicken pasta recipes. None of these can match a really good best chicken soup recipe for flavor.